Beach house by Geller. Photo © Alistair Gordon. 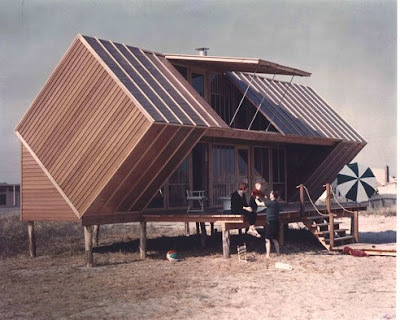 Andrew Michael Geller, modernist architect known for whimsical beach houses, died on Christmas day at age 87 in Syracuse, NY (my alma mater). Despite having a passion for modern architecture and it being a major part of my professional life, I have never heard of Geller before. Shows what an amateur I still am; you learn every day. My guilt only subsided a tad when I found that even Triangle Modernist Houses' massive modernist archive didn't catalog him (yet) either. WSJ contributing editor, blogger and author Alistair Gordon published a book about Geller in 2003: "Beach Houses: Andrew Geller", and a lovely article named "Andrew Geller, Architect of Happiness, 1924-2011", which includes excerpts from his book.